MALAYBALAY CITY (May 22) Twenty-one year old Irene Kristine Delarmente, a licensed teacher, chose to serve the Sangguniang Kabataan first before practicing her profession. “We know the SK can be a good foundation for good governance in our community,” she said in an interview on May 22 after attending her town’s schedule for the one-day SK mandatory training in Bukidnon State University (BukSU). “It is very helpful for us to become more effective and efficient,” said the physical education graduate who won against four opponents as the SK chair of Barangay Poblacion of Impasug-ong town. She said she highly appreciated the fact that the training is required for them to practice good governance. 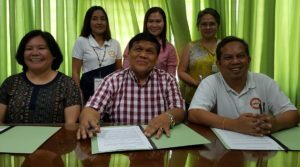 The Department of Interior and Local Government (DILG)-Provincial Office has tapped BukSU as a learning resource partner to conduct the mandatory training for a portion of Bukidnon’s towns and cities. SK officials were scheduled to attend the training on May 17 (Cabanglasan), May 18 (Lantapan), May 19 (Libona and Sumilao), May 21 (San Fernando), May 22 (Impasug-ong), May 23 (Manolo Fortich) and May 24 to 26 (Malaybalay). Dr. Jiemalyn Paulican, chairperson of the ComDev/Devcom department of the College of Social Development and Technology, said the project, a foundation course on governance, is an extension project involving the whole university, not just the college. “It is important to hold the mandatory training to provide basic and necessary knowledge for SK officials to serve their office,” project leader Paulican, said. She added that mandatory training is one of the reforms pushed in the SK Reform Act of 2015 or Republic Act 10742. As cited in the law’s implementing rules, the purpose of requiring the training is to emphasize the role of the youth in nation-building and molding them to become better citizens with the values of patriotism, nationalism and honor as a Filipino. “They cannot assume into office without going through the training,” Paulican told the Piniyalan Reporting Governance radio program on May 5. According to the memorandum of agreement, signed by BukSU president Dr. Oscar B. Cabañelez and DILG provincial director Engr. Carmelo Enrique B. Libot, BukSU will manage and facilitate the conduct of the training, among other functions. The MOA also cited that BukSU as an LRI has the expertise and is committed to provide high quality training and learning in the conduct of the training. Paulican said speakers from BukSU, the DILG and the Local Government Units were tapped to speak on a total of five sessions and modules including Decentralization and Good Governance, SK History and its Salient Features, Meetings and Resolutions, Planning and Budgeting and the Code of Conduct and Ethical Standards for Public Officials and Employees. Among the speakers for Decentralization and Good Governance are DILG’s Libot, BukSU public administration faculty Emmanuel Jesus T. Barroso and Dr. Algerlina I. Edma of the Local Youth Development Council LYDO) of LGU-San Fernando. Mr. Dante S. Victoria, BukSU vice president for administration, planning and development and Mr. John Mark P. Timay of the Malaybalay LYDO, are among the speakers of the last session on Code of Conduct and Ethical Standards. Delarmente said for her the most striking topic was on the last session. “I really admired the topic on Code of Conduct and Ethical Standards. It is an important basic knowledge because as role models, the SK officials should set as examples among the youth in the community,” she added. She said she also valued more the need to respect cultural diversity because of the session, adding, her town is the tribal capital of the province of Bukidnon. The topic on planning and budgeting, she added, appeared to be the most difficult. “We need more discussion on this complicated topic given the limited time. We hope to get it in succeeding training,” she added. Delarmente said she is more excited to serve after the training. She plans to initiate sports development in her barangay.